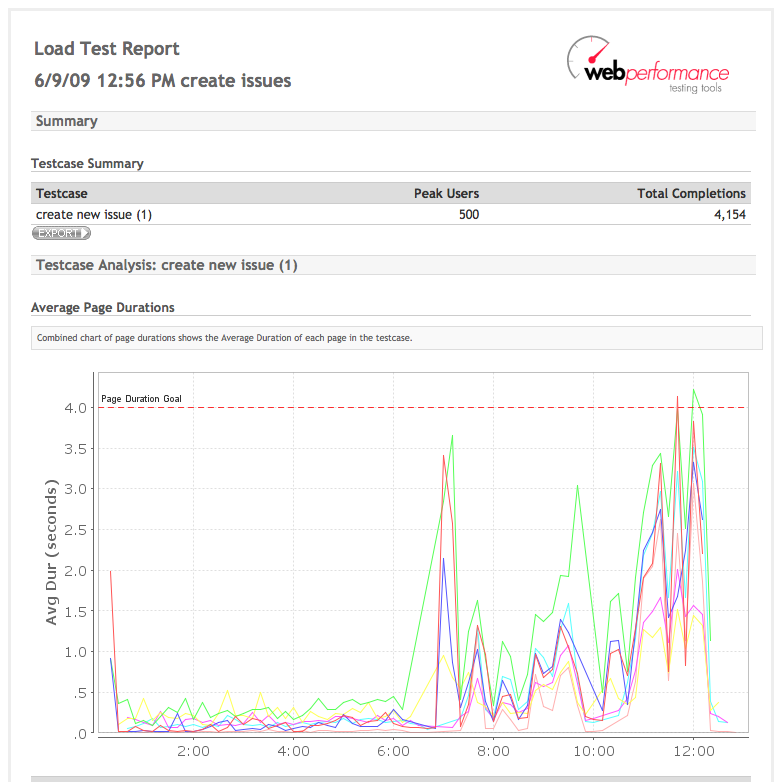 The following screenshots show the major sections of the reports in the Web Performance Load Tester™. Click on any of the screenshots to download a PDF of that section. Reports can easily be viewed in a browser, and from there printed, saved for editing in your favorite HTML editor, or exported to Microsoft Word™. We invite you to view a sample report in your browser. Statistics are displayed in both graph and table form, and can be exported into a spreadsheet from right within the browser. 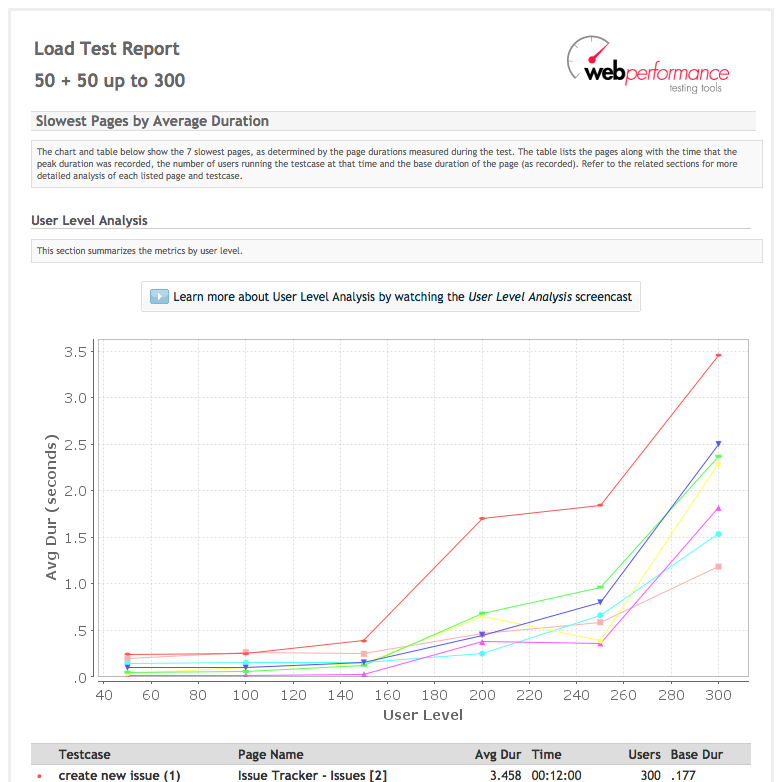 The Load Test Report contains all of the information about a particular load test. The summary section is the first, and gives a variety of high-level statistics like the estimated user capacity, peak users simulated, hits/sec, etc. The server statistics are included in this level so its easy to see at a glance if such things as web server CPU load and memory usage had an impact on performance. 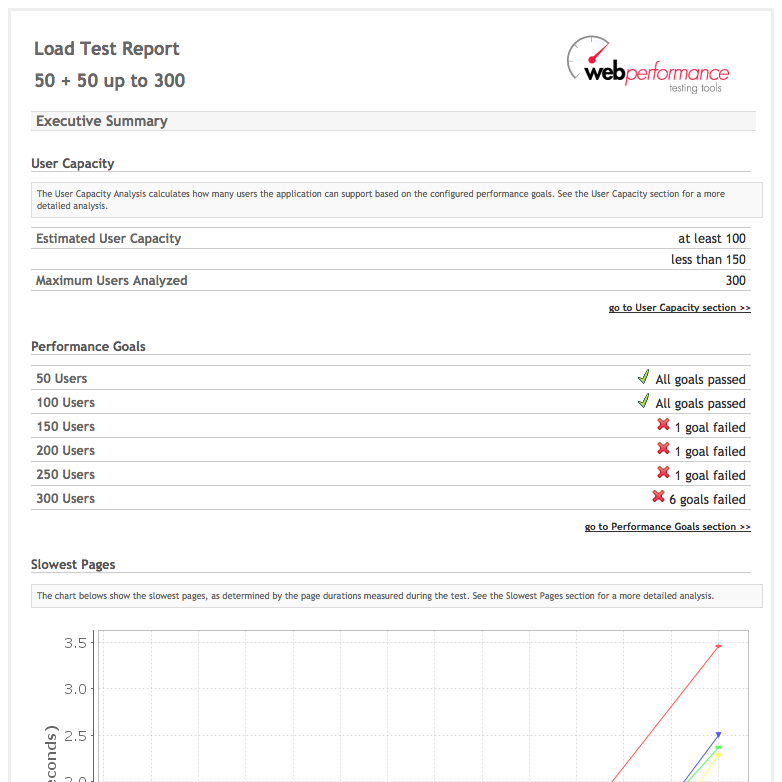 The User Capacity section shows the measured user capacity, or how many users the web-based application could take while still meeting performance requirements. How this measurement was arrived at is demonstrated in the chart, which shows the duration and error thresholds. The place at which the measured duration and error count intersect the threadholds is the measured capacity. 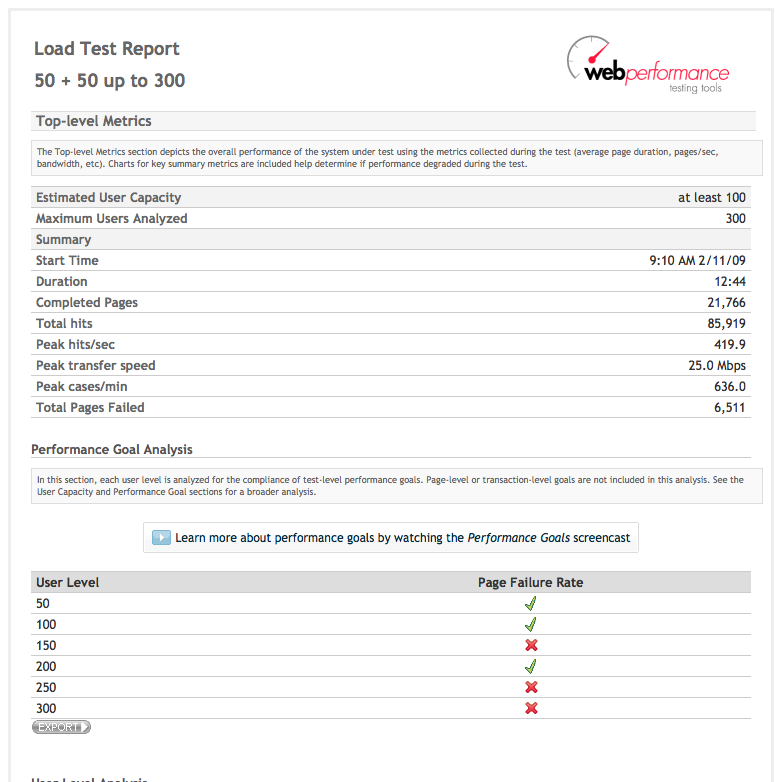 The Peak Page Duration table shows the slowest pages in the test, and compares the performance under load to the baseline performance. This shows the problem areas at a glance, and provides enough detailed information in one place to investigate the problem. The configuration section gives all of the information about how the test was configured. The testcase section gives statistics and measurements about each test case in the test. 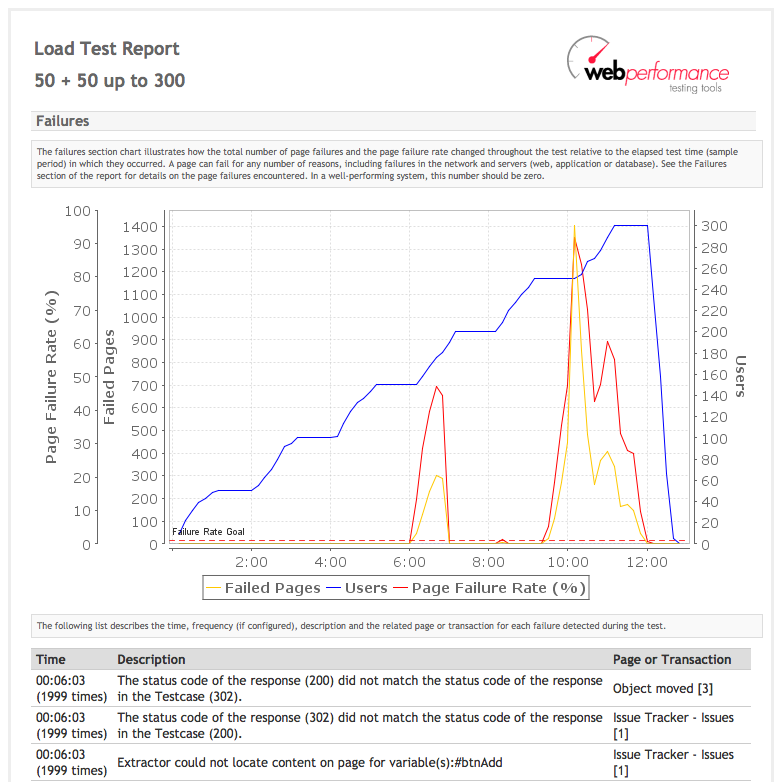 More than one test case can be run simultaneously, so this report helps find out which of the testcases are having performance problems. If the testcase contained a business-case, say making a purchase, then the measurements here will correspond to how long it would take a customer to make a purchase under load. The Web Pages section contains detailed statistics for each web page, including how the minimum, average, and maximum load times changed at each point in the test, the bytes transferred, and bytes per second. The errors section shows how the errors changed throughout the test, giving detailed information about each error, including when it happened and a description of the problem. To avoid the very common situation where the same error is repeated over and over again, errors are summarized. The testcase section gives statistics and measurements about each test case in the test. 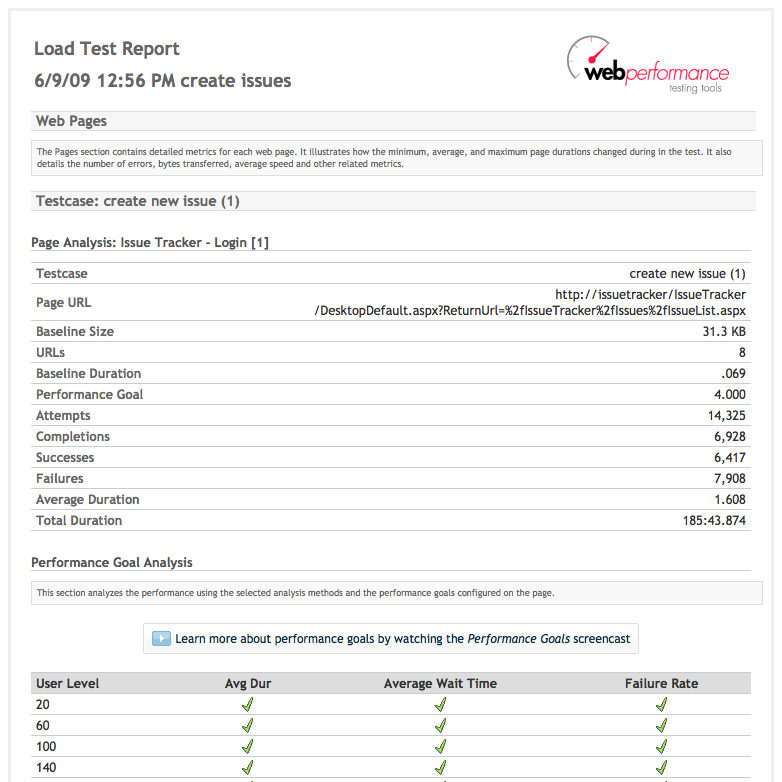 More than one test case can be run simultaneously, so this report helps find out which of the master are having performance problems. If the testcase contained a business-case, say making a purchase, then the measurements here will correspond to how long it would take a customer to make a purchase under load. A Baseline Report is very important because it tells what the initial performance of the system is when not under load. The web server will never be any faster than this! 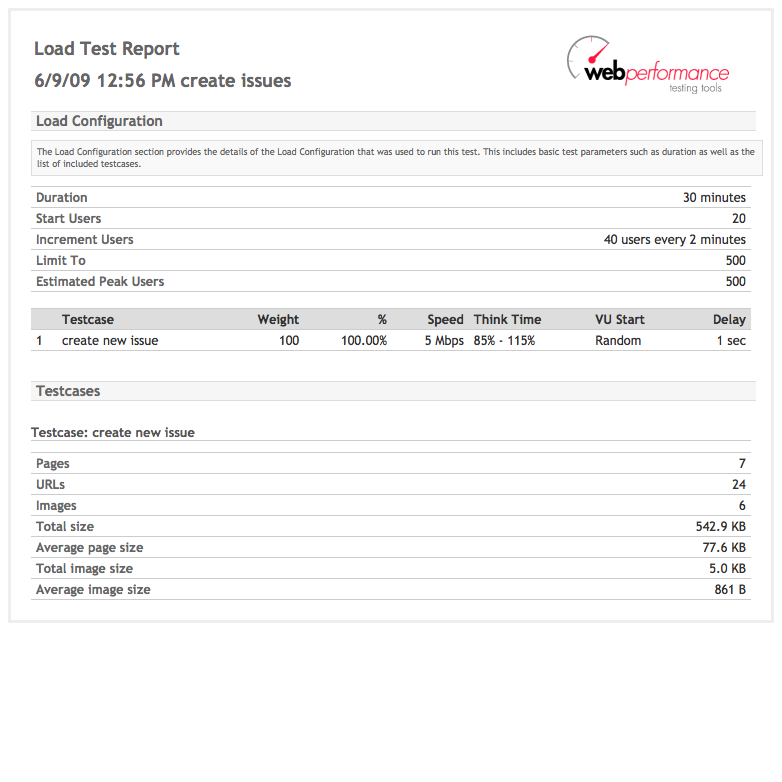 A baseline report starts from a particular load configuration, and then calculates the beginning performance, and the requirements for the test. 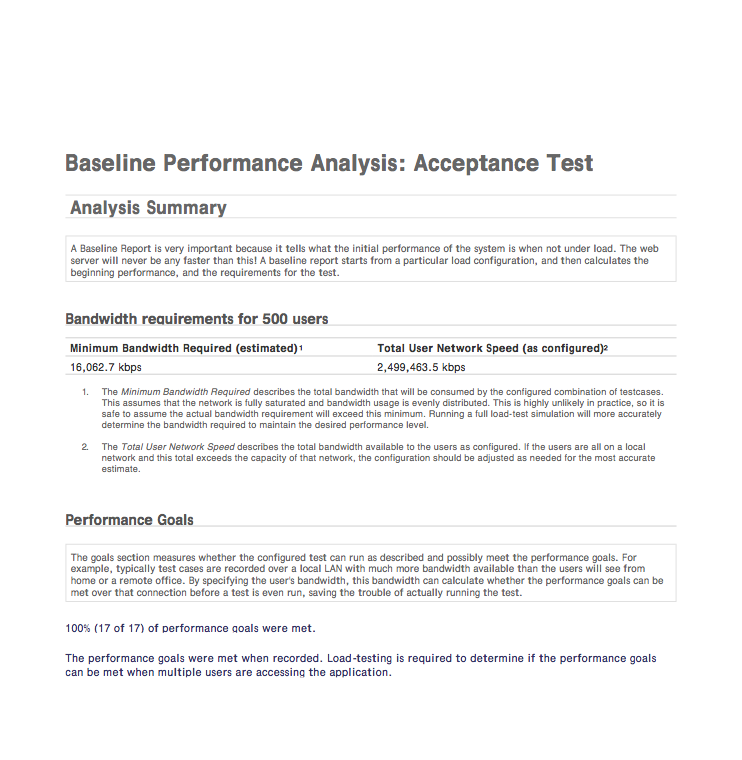 In the example report, right, the bandwidth requirements are analyzed for a 500 user simulation. 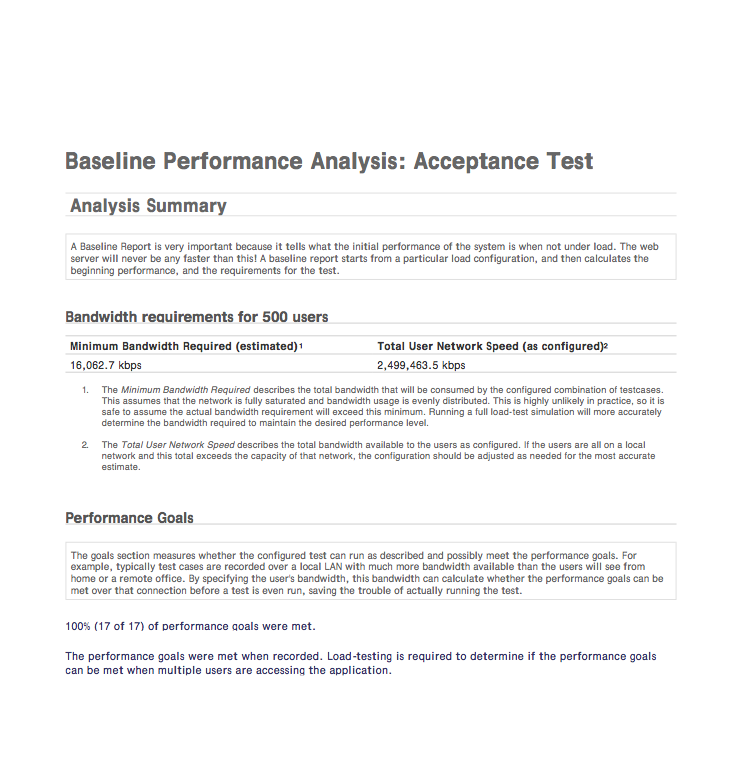 The bandwidth section of the report calculates the bandwidth requirements to run the specified test cases at the described load. This is great for bandwidth capacity planning before starting a large load test. 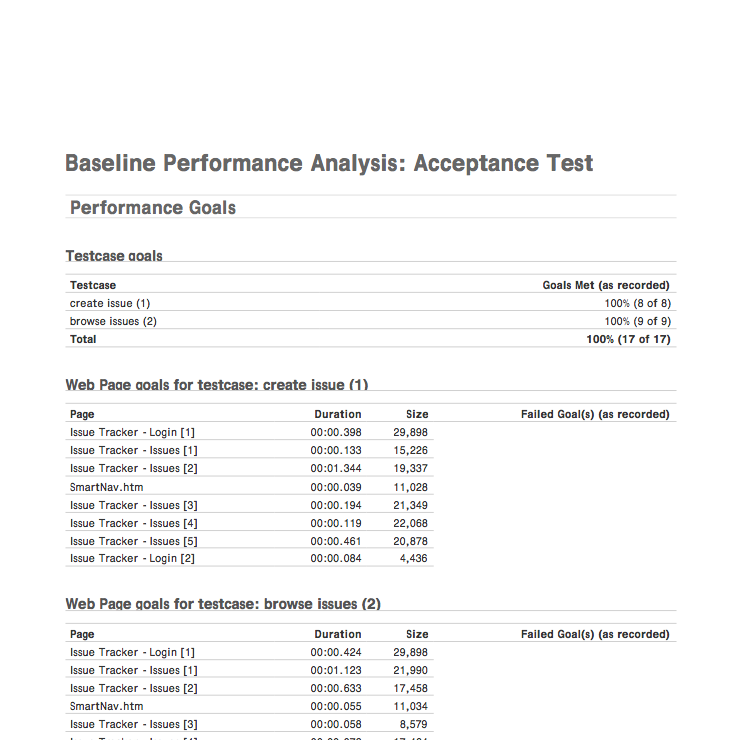 The goals section measures whether the configured test can run as described and possibly meet the performance goals. For example, typically test cases are recorded over a local LAN with much more bandwidth available than the users will see from home or a remote office. 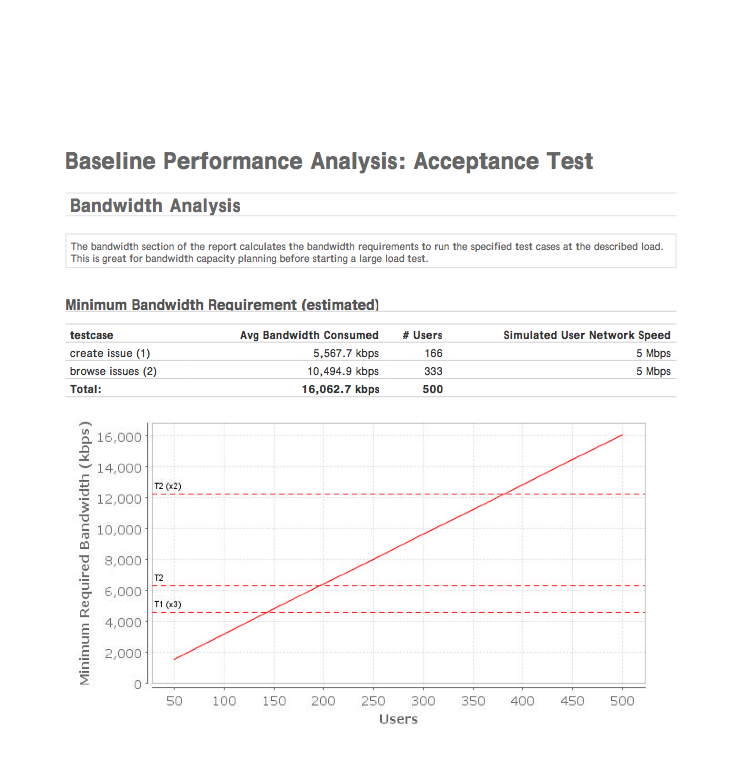 By specifying the user's bandwidth, this bandwidth can calculate whether the performance goals can be met over that connection before a test is even run, saving the trouble of actually running the test. The master section of the report calculates the master requirements to run the specified test cases at the described load. 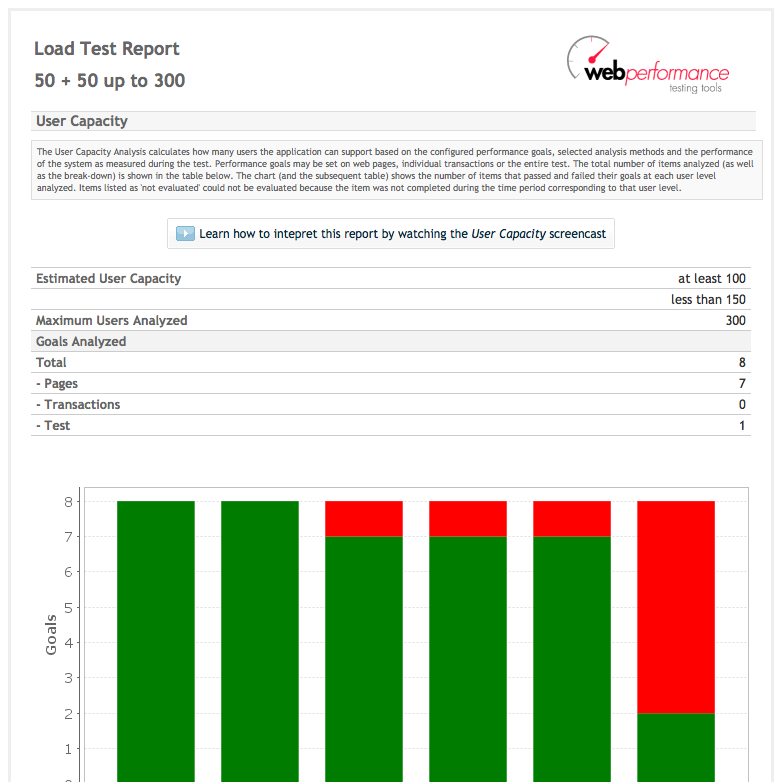 This is great for master capacity planning before starting a large load test.